Blueflow Energy Management AB - MRV is coming up - We are ready, are you? A ship like Väddö roughly consumes 250.000 liters/year. A realistic fuel saving on this kind of ships with as Blueflow system installed is about 10%. That means about 25.000 liter/year, corresponding to about 65 tons of CO2. M/S Östan online! We have had a really busy week ending up with yet another ship online. 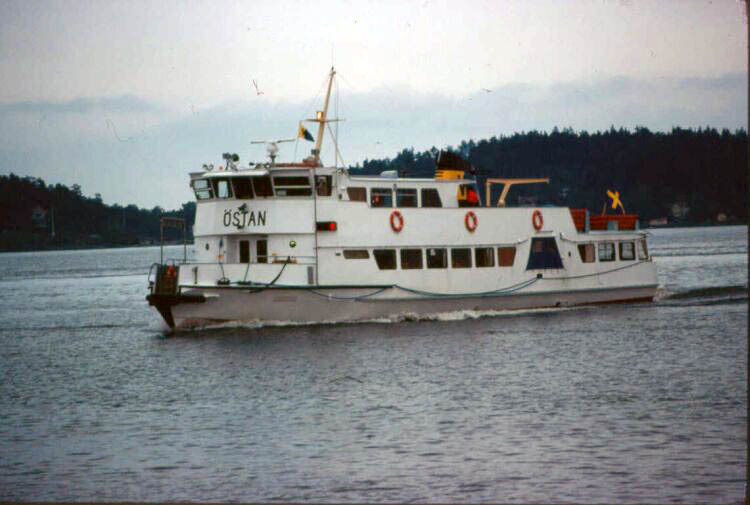 This time it is M/S Östan operated by Blidösundsbolaget. We are looking forward to following their work in upcoming fuel saving projects. Having so many ongoing projects at the same time requires installation partners that really deliver in time. This installation was carried out by MarinElektro in Sollentuna. Thanks for excellent support! M/S Sjöbris – Welcome to the Blueflow family! We mix small with big, both equally important! Last week Blueflow was commissioned on M/S Sjöbris, an archipelago ship operated by Blidösundsbolaget in Stockholm. Three Scania engines are now monitored and a the ship is ready for ECO-driving projects. A ship like this typically saves between 10-20% of fuel, simply by giving the crew awareness and possibility to follow up different driving techniques. This installation was carried out by MarinElectro, thanks Johan for your support! Blueflow Energy Management system is now installed on the electric ship E/S Aurora, operated by ForSea Ferries. Aurora and her sister vessel Tycho Brahe are the world´s largest electric ferries equipped with batteries holding more than 4 MWh of electric power each. This enables fully electric operations 24/7. In this project we measure all parameters relevant for eco-driving. Thruster power is separated in the reports and the graphical mimics on the bridges gives total control of the propulsion power. The initial results are very promising and we really look forward to follow this project. M/S Rex online. Next ship to be commissioned is M/S Rex. An old lady built 1937, operated by Blidösundsbolaget. One engine connected to an NMEA2000 network is interfaced via signal converters from Kvaser. All information is presented on a 12″ marine display from Olorin. We look forward to follow Rex online, and wish Blidösundsbolaget good luck in future fuel saving projects. Next online Göta II! Göta II is a freight ship operated by Styrsöbolaget in Gothenburg. 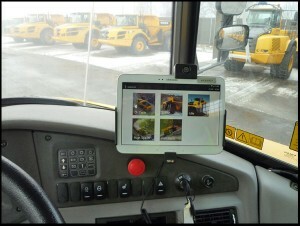 The main engine is a CAT 3508C and the engine is interfaced via modbus RTU to an Auto-Maskin control system. Thanks again to AB Ramantenn for the installation! Next ship online, this time M/S Fröja! Operated by Styrsöbolaget in the archipelago of Gothenburg. Fuel consumption and other relevant parameters are collected from a modbus serial communication line between the Blueflow computer and the Volvo Penta engine control system. The installation was carried out by our partner AB Ramantenn. Many thanks for a professional work done, as always! A warm welcome to M/S Yxlan! Waxholmsbolagets newbuild Yxlan made her maiden voyage last week. She is built in Estonia by Baltic Workboats, and Blueflow was integrated already from the start. Yxlan is an electric hybrid equipped with batteries, diesel generators and electric propulsion. It is really interesting following all these new electric projects. Yxlan will be operated by Blidösundsbolaget, and she joins their Blueflow fleet together with Sjögull and Silverö. M/S Sjögull is now online. She is operated by Blidösundsbolaget, a new customer to us, and we are looking forward to a long-term cooperation together. The installation was carried out by MarinElektro, and we want to thank them for a very professional work done. Sjögull is equipped with three main engines from Scania, and all parameters needed are collected from the engine control units, without any need for additional sensors. Contact us and we will tell you how to gain fuel- and energy control of your ship as well. Next ship joining the “Blueflow fleet” is M/S Saxaren, operated by Skärgårdsbolaget in Stockholm. Flow and energy meters are mounted on main engines, generators and boilers. This ship is equipped with variable pitch propellers, and that adds an extra dimension to the maneouvering. The crew is now able to evaluate which RPM and pitch settings that gives the optimum fuel economy. The ship went online today, and is right now out for the first Blueflow-equipped trip. Again, we want to thank our partners in the project. The flow meters from Aquametro was delivered by Ambiductor, and the installation was carried out by Robin at El- & Marinteknik. HH-Ferries/Scandlines Helsingborg-Helsingör installs our fuel- and energy management system Blueflow On-board™ and Blueflow Online™. The system is to be installed on M/S Aurora during the autumn this year. Aurora is, together with her sister ship Tycho Brahe, the world´s largest fully electric emission free ship. She is powered by 2 battery packs with a total of app. 8 MWh energy, enabling fully electrical operations 24/7. 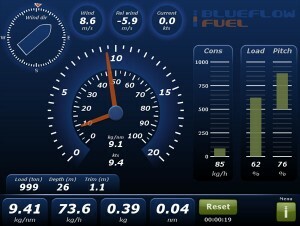 With Blueflow, the crew and the office will now have 100% awareness of the ships fuel- and energy consumption. The system will be able to report and analyze every trip and every maneuver down to every single kWh. Propulsion power will be separated from the rest of the ship´s energy consumption, enabling eco-driving projects to be analysed in detail. Next tug Online! Yesterday we visited port of Luleå for comissioning of Blueflow on their tug Viscaria. Everything went well, and Viscaria is now online and ready for reporting in Blueflow Online 3.0. Two displays on the bridge gives the crew full awareness of the ship´s momentary fuel consumption, enabling effective eco-driving. We want to thank port of Luleå for this order, and we are looking forward to supporting you in future fuel- and energy saving projects. Next steamer Online, this time S/S Storskär! We are happy to announce commissioning of Blueflow on this old lady, built 1908 at Lindholmens varv in Gothenburg. We now measure and report fuel consumption of the diesel boilers, generated power from the auxiliary engine and shore power energy. The challenge with this installation was to not interfere with the classical interior of an old steam ship. All necessary equipment is “hidden” as far as possible not to disturb the feeling of being on an old steamer. Our first steamship online:-) Blueflow is now commissioned on the steamship Norrskär, operated by Waxholmsbolaget in the archipelago of Stockholm. This ship is built in 1910, and equipped with a steam engine from Eriksberg. The steam is generated from three diesel boilers and the fuel consumed is measured with a flow meter from Aquametro. Of course, fuel economy is not the priority of this installation. It is more about having all fuel consumption for the hole fleet available in a common report platform, and Norrskär now joins the rest of the fleet in Online 3.0. The latest ship joining Blueflow is M/S Vaxö. She is equipped with three main engines from MTU where the fuel consumption is measured with flowmeters from Aquametro. Energy consumption from the two auxiliary engines and the shore power is collected from the existing information system onboard. Finally we mount a Badger flowmeter on the boiler. All information is now presented on-board and in our web platform Blueflow Online 3.0. The installation was carried out by Robin at El- och Marinteknik in Stockholm. Many thanks for good support! New installation on M/S Teaterskeppet. Many thanks to Niklas and Alex for your new-born interest in our product. We hope you will find it useful and we are ready to support you in your upcoming fuel- and energy related projects in the future. Last successful installation this year be came the tug Bison! Operated by Buksér og Berging on the western coast of Sweden. With great support from CAT we interface the engines ECU and collects fuel consumption and other relevant parameters. “Tug-related” software functions will now be developed to suit Bison´s operations perfectly. Many thanks to BuB for showing interest in our product. We also thank CAT for good support. The installation was carried out by AB Ramantenn. Blueflow now commissioned on Viking XPRS! Wit h this installation, Blueflow is now installed on the last ship in the Viking fleet. 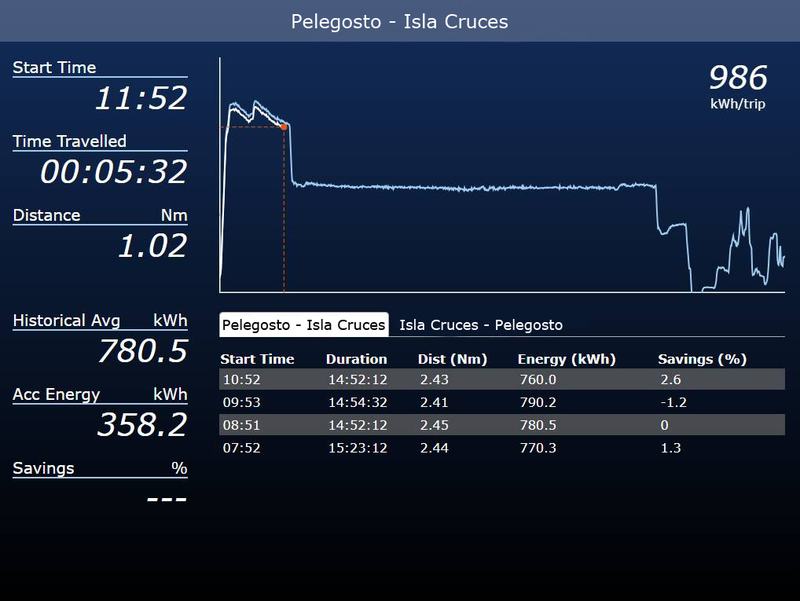 The crews on-board, and the office, now have full control of the fleet´s fuel and energy consumption. The goal, to be fully operational on all seven ships before the end of 2017, is now achieved. The web portal Blueflow Online 3.0 generates fuel and energy efficiency reports for each ship individually, or for the hole fleet in total. Every single parameter measured on-board is monitored and ready for analyzes. All routes are automatically detected and reported. M/S Visby and M/S Gotl and Online and MRV-ready! We are now fully integrated on M/S Visby and M/S Gotland. Retro-fitting of a Blueflow system is like a parameter puzzle, and the system is designed for each ship individually. On these ships we integrate with the Lyngsö automation system for engine parameters. Other signals are collected from NMEA, analog signals, and direct communication with flow-meters. The ships are now also fully compliant with the MRV-regulation and ready to start measure and report accordingly. Many thanks to Destination Gotland for placing your confidence in us. Next ship online is an old lady. 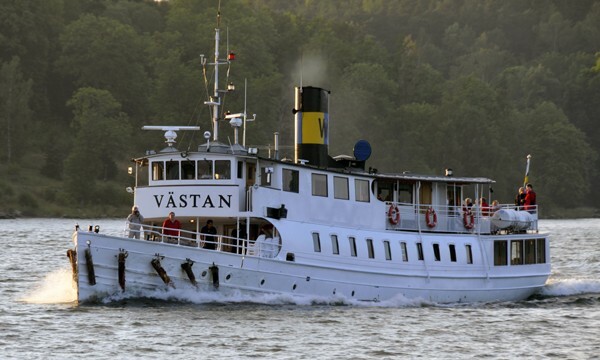 Västan, built year 1900, is a diesel-electric ferry equipped with two main generators from Volvo Penta. They power one electric motor from ABB. Diesel and electric parameters are now displayed on a screen on the bridge which enables eco-driving in a more efficient way. Additional fuel meters on the heater, and energy-meters on the shore-connections gives the operator 100% control of the ship´s energy consumption. The ship now joins the rest of the fleet in our cloud platform Blueflow Online 3.0. The installation was carried out by El- och Marinteknik and we also had good support from Callenberg Automation. Many thanks to all involved in this project. The Blueflow rollout at Harbour City Ferries in Sydney continues as planned with all First Fleet vessels up and running. Work has now started on the river and harbour cats so it won’t be long until the whole fleet is ready. Viking Cinderella now online and MRV-ready! The Blueflow installation on Viking Cinderella is now complete. Emerson flowmeters installed on main engines, auxiliary engines and boilers combined with other selected signals are presented in the machine room and on the bridge for easy follow up of different operating methods. Signals from electrical energy meters are used to calculate efficiency on the gensets, and all parameters are also available for report and statistic analyze in our cloud platform Blueflow Online 3.0 Automatic data exchange of passenger and cargo information now makes the ship ready for MRV. Contact us for more information. Another ship online. This time on the small archipelago ship Utö Express operated by Utö Rederi. Fuel consumption on the two Scania main engines are monitored via CAN-interface. Auxiliary engine power is measured via the engine control panel and the boiler consumption is measured with a flow meter from Swiss company AIC. 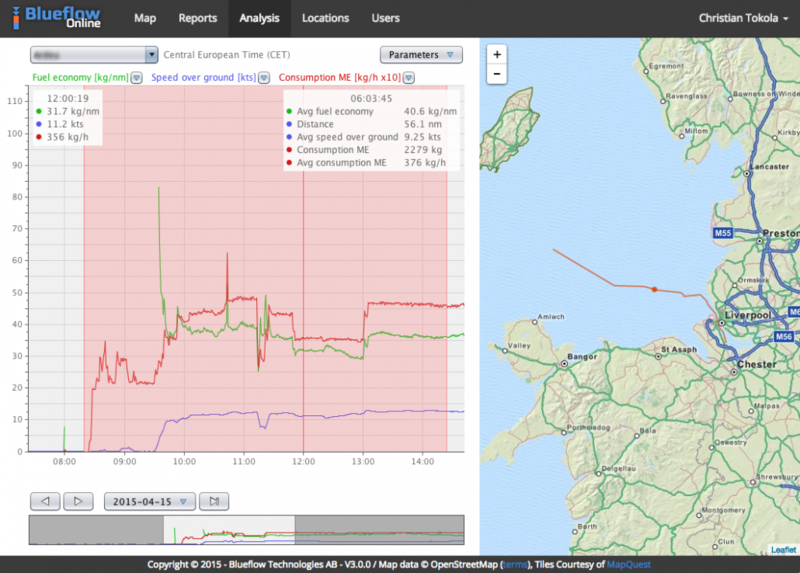 All data is presented on board and online for easy control of energy consumption. Next installation to be Online is M/S Gabriella. The ship is now equipped with flow and energy meters on main engines, AUX engines and Boilers. This information, combined with other relevant signals are displayed on the bridge, in the control room and in our Energy Management platform Online 3.0. The ship is now also prepared for the upcoming MRV-regulation 2015/757. More installations commissioned! This time on the two diesel-electric river shuttles Älvfrida and Älveli operated by Styrsöbolaget in Gothenburg. Focus on this projects was calculation and presentation of electric efficiency of the vessel. The parameter kWh/Nm is presented on the bridge and the vessel´s total energy consumption is now available for reports online. Blueflow now commissioned on Viking FSTR… We are proud to announce that Blueflow is now commissioned on the High Speed Catamaran Viking FSTR. Fuel consumption is measured with high accurate flow meters from KRAL and two displays on board gives the crew full control of the ship´s fuel and energy consumption. This ship is now online for data analyzes and report functionality and is number two out of seven in sequence of Viking ships to be installed during the year. Next vessel installed is Djurgården 11. 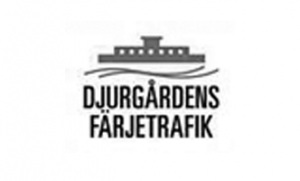 This double-ended city ferry is operated by Djurgårdens färjetrafik in the central of Stockholm, and is one out of four similar ships in the fleet. One main engine, one AUX engine, one boiler and one shore connection is measured and presented on the bridge and in Blueflow Online 3.0. This installation was made by Thomas Wallinder at TA Wallinders teknik. Thanks for a job well done! B lueflow news from “down-under”… After a successful trial, Sydney Ferries (Harbour City Ferries) have decided to roll out Blueflow Fuel to a total of 22 vessels, starting with the Freshwater class, followed by the First Fleet class and finishing up with the Harbour and River Cats. First off the rank was Freshwater which became fully operational last week. #In swedish: Nästa installation blev på M/S Skärgården. Varje båt är som ett projekt där vi lägger ett parameterpussel. På detta fartyg blev lösningen en mix av inkoppling till NMEA2000-nätverk, Beijer-paneler och direkt mot bränslemätare. Samtliga förbrukare ombord, huvudmotorer, hjälpmotorer, värmepanna och landström, presenteras på skärmar samt i Blueflow Online 3.0 där den görs tillgänglig för uppföljning och kontroll. Återigen utfördes installationen av El- och Marinteknik på Beckholmen. #In swedish: Alla bäckar små… Vi har nu kompletterat befintlig Blueflowinstallation på M/S Roslagen. Tidigare mätningar på huvudmotorerna har nu utökats med mätning på hjälpmotorer, landströmsanslutning samt värmepanna. Beslutet att komplettera mätningarna ger nu besättning och fartygsoperatör total kontroll över fartygets totala energiförbrukning. Installationen utfördes av El- och Marinteknik på Beckholmen. Destination Gotland chooses Blueflow Energy Management System™ as their MRV and Energy-Efficiency platform. Blueflow is very proud to work with Destination Gotland in their MRV and energy-efficiency efforts. Blueflow Energy Management System™ is compliant with European Union Monitoring, Reporting and Verification (MRV) rules and will be used in Destination Gotland’s daily MRV work along with efforts in reducing carbon prints and energy consumption. 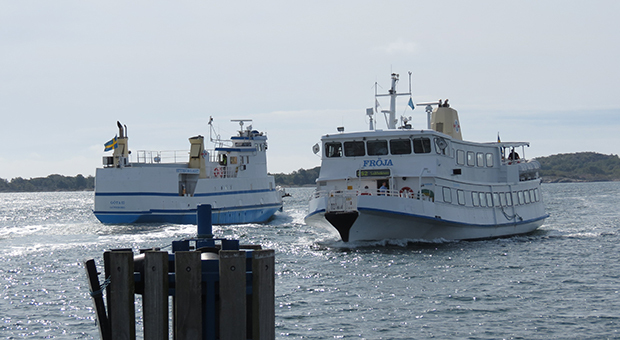 M/S Visby and M/S Gotland will be first out to be equipped with Blueflow Energy Management System™. #In swedish: Blueflow goes electric… Tillsammans med Callenberg har vi nu installerat Blueflow på Rederi Ballerinas elfartyg E/S Sjövägen. Fartyget är helt elektriskt och drivs med två stycken elmotorer på vardera 125 kW. Genom inkoppling mot fartygets befintliga automationssystem så mäter och beräknar vi parametrar som kWh/Nm, batteristatus, laddeffekter och mycket mer. Fartyget kompletterar redan befintliga installationer på Gurli och Kung Ring i Blueflow Online 3.0. För mer information om projektet, kontakta oss på telefon 0854021680 så berättar vi mer. #In swedish: Då var årets sista installation driftsatt. På M/S Sandhamn mäts bränsleförbrukningen på fyra stycken Scaniamotorer. Det görs genom inkoppling till befintliga Beijerpaneler på bryggan. Hjälpmotorernas uteffekt mäts med energimätare och systemet beräknar sedan bränsleförbrukningen genom mappning mot motorernas verkningsgradskurvor. Två landströmsanslutningar mäts också med energimätare. Värmepannans förbrukning mäts med flödesmätare från Schweiziska företaget AIC. Installationen utfördes även denna gång av El- och Marinteknik på Beckholmen. Som vanligt tackar vi för ett gott samarbete och ser fram mot fler projekt tillsammans nästa år. #In swedish: Då är nästa installation färdig. Denna gång är det Vaxholmsbolagets fartyg M/S Söderarm som utrustats med Blueflow för mätning och uppföljning av bränsle- och energiförbrukningen ombord. All information samlas in, presenteras på bryggan och skickas till vår server Online 3.0. Servern genererar sedan detaljerade rapporter som möjliggör uppföljning av bränslebesparande åtgärder. Denna gång utfördes installationen av El- och marinteknik och vi tackar för ett bra utfört arbete. #In swedish Då är nästa installation klar. Denna gång Styrsöbolagets fartyg M/S Vipan. I och med denna installation har Styrsöbolaget nu totalt 11 fartyg med Blueflow installerat. Systemen ger besättningarna ett bra verktyg för ECO-driving, och rederikontoret får full kontroll på flottans bränsleförbrukning. Blueflowgänget tackar Styrsöbolaget för det utökade förtroendet. Installationen utfördes som vanligt i samarbete med AB Ramantenn. #In swedish: Ny installation klar, denna gång på Styrsöbolagets fraktbåt Ärlan. Motorparametrarna mäts genom inkoppling mot befintliga Beijerpaneler på bryggan. Vi tackar Johan på AB Ramantenn samt Magnus på MAGH för gott samarbete under installationen. Welcome to meet us in booth 81 at the Maritime Day, Thursday 9 May 2019 in Mariehamn! ECO-driving taken to the next level! With our newly launched function “Blueflow ECO-trip” the driver of the ship gets instant feedback of the ship´s fuel- and energy consumption. The graphical interface compares current trip with last trip on the same route, and different driving techniques are directly comparable. All historical routes are compared in a list, and average values are calculated and presented. Saving fuel and energy is not magic. It is about hard work, training and motivation combined with a support system that actually enables follow-up of implemented measures. Doing this correctly, 10-20% of saved fuel is fully realistic targets. If interested, please contact us and we will help you save fuel as well. The MRV EU-wide legal framework is here! We have an MRV solution ready for you! The movie in the background is from the bridge of the vessel M/S Viking Grace. Operated and owned by our customer Viking Line. 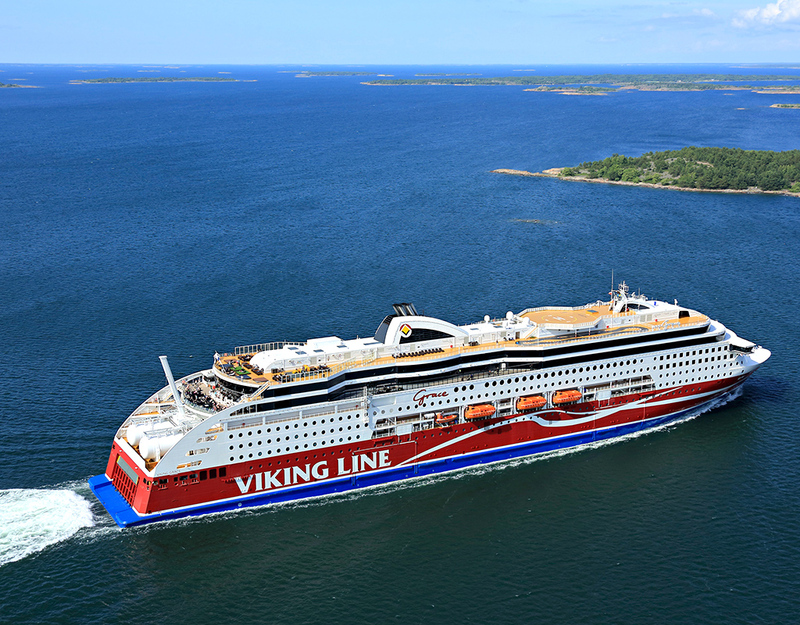 Viking Line uses Blueflow Energy Management System in their MRV work and also in their daily efforts in reducing energy consumption and carbon prints. Some of our new Blueflow installations – Welcome to the Blueflow family! The Blueflow Energy Management System helps you manage your vessels’ energy sources. It presents consumption and energy efficiency data on intuitive graphical user interfaces onboard your vessels. It collects and sends data to our cloud platform for secure storage and easy data analysis. Blueflow Online™ and Blueflow Onboard™. Blueflow Online™ is our secure cloud platform that stores vessel data with a resolution of one second. Ultra-fast data processing enables almost unlimited possibilities to find complex relationships of the data on a vessel. These findings can be used to reduce energy consumption, make diagnostics, take comprehensive reports and increased knowledge of a vessel’s performance. Blueflow Onboard™ integrates with various other onboard systems and flowmeters to monitor fuel and energy consumption and other parameters in real-time. Parameter data are sent to Blueflow Online™ for reporting, analysis and verification. Various displays can be installed for eco-driving and monitoring of energy consumers. Shipping companies must now begin monitoring and reporting vessel greenhouse gas emissions for ships of more than 5,000 GT loading or unloading at European ports. Owners will need a monitoring plan for every ship, and will need to submit annually verified emissions reports to the European Union covering all voyages to/from/within Europe. Mandatory ship emissions monitoring will begin from 1 January 2018, but owners should have submitted monitoring plans by the end of August 2017. Our MRV solution is based on many years experience and knowledge of energy measuring and reporting. Our state the art IT energy management platform, widely used and developed during many years fits the MRV regulation demands very well. Our MRV solution includes all MRV requirements such as monitoring plans, voyage emission reports and much more. Some of the world’s largest manufacturer of trucks and construction machinery use Blueflow Test Management System for rigorous testing in the development and evaluation of new models and designs. Blueflow meets their extreme demands on accuracy, reliability and of course the duty of confidentiality as their business demans. High security both in terms of software and personnel has a high priority. Our own state of the art data engine optimized for big data and heavy analytics workloads. Blueflow Onboard™ – The real-time tool for the crew on the bridge. Integrates with various other onboard systems and flowmeters to monitor fuel and energy consumption and other parameters in real-time. Parameter data are sent to Blueflow Online for reporting, analysis and verification. Blueflow Onboard™ – The tool for the engine room. Displays relevant information such as fuel consumption, power production/usage, fuel consumption for heating and more. Fully customizable views to suit different boats and configuration. Blueflow Data transmission – All collected parameters are continuously sent to Blueflow Online™ to be used directly from the office or for generating reports. Blueflow Energy Management AB is stationed in Stockholm, Sweden. Blueflow Technologies specializes in measurement, analysis, optimization and monitoring of fuel and energy consumption. Blueflow was founded in April 2006. In 2010 the focus shifted from the leisure marine market to the commercial market. Blueflow Energy Management AB is combining state of the art fuel measurement instruments used in heavy industy applications with cutting edge technology from the IT sector. Blueflow delivers a platform where companies can get control over their fuel consumption, find best routes and speeds for their vehicles, know when it is time to service engines, and much more. All this from simply using an onboard fuel display and an easy to use web interface to our centralized servers where fuel data, vessel positions etc. are being logged. Blueflow can help you implement a energy management solution combining our products with training and help on how to save fuel and the environment at your company. Saving fuel is not just about installing fuel flowmeters on all your vehicles, it is also about using the gathered information so that you can take the right measures, and follow-up on those measures. Worldwide there is a a growing demand of saving fuel. Not only because of the rising fuel costs, but also because of the climate change situation that we are all part of. Let us help you to reduce your impact on the climate change. And let us help each other. Blueflow provides the tools you need, but maybe you also need some consulting on the way? Let us tell you our ideas, and share our experiences from others, in the same situation. Want to know when we got news on our latest products? Sign up for our newsletter now! Our product suite developed for the testing and development process in the automotive industry. Trucks, excavators, wheel loaders, dumpers and more. For example, real-time measurement of the temperature of the fuel for the direct calculation of the volume.